A 250 GTO and a Goodyear Blip. 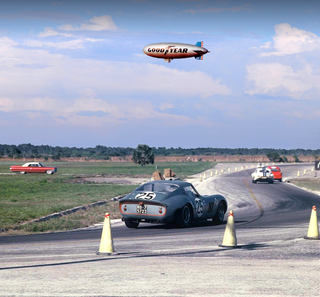 Welcome to Sebring in 1963! The Rosebud Racing Team Ferrari 250 GTO of Richie Ginther and Innes Ireland heading out to the airport straights at Sebring in 1963. Overhead the Good Year blimp watches the action and in some races reported the action on commercial radio. The car was powered by a three-liter V12 and would finish 6th and 13 laps behind the winning factory Ferrari 250 prototype of John Surtees and Ludovico Scarfiotti. The E-type Jaguar in the photo was driven by John Fitch and Briggs Cunningham and failed to finish.